Suits of Armor for sale are over 6 ½ feet tall. This medieval Suit of Armor is fully articulated, historically accurate and meticulously hand forged of 18 gauge steel by master blacksmiths. 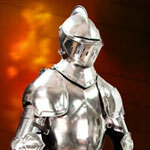 In the late 14th Century, full plate armor was predominately produced in Germany and Italy. The Italian Gothic Armor, offered both protection and comfort and thus became in high demand in medieval Europe. Buy this handsome full-sized Suit of Armor now for sale in either the Duke of Burgundy or Italian Gothic design. 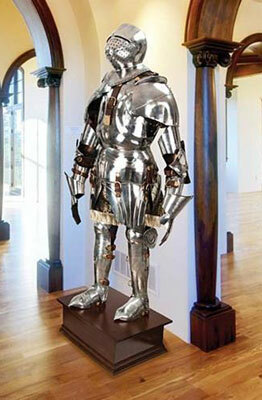 Duke of Burgundy Suit of Armor for sale stands approximately 6 ½ feet tall. The fully articulated Duke of Burgundy Suit of Armor is a full suit of medieval armor designed upon a 1450’s Italian style. 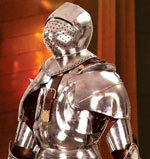 This beautiful armor is constructed of 18 gauge, hand forged steel and crafted by master blacksmiths. This knightly suit of medieval armor is shipped partially assembled with a gorgeous hardwood display pedestal. Duke of Burgundy Suit of Armor includes a full size skeletal body and decorative skirt. Due to the limited availability of this suit of armor, this item can only be shipped to the verified billing address of the credit card or PayPal verified address. No alternate shipping arrangements may be made. 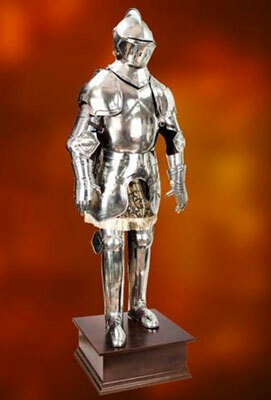 Buy this incredible Duke of Burgundy Suit of Armor for $2399.99. Gothic Suit of Armor for sale stands approximately 6 ½ feet tall. The fully articulated Italian Gothic Suit of Armor is a full suit of armor designed upon medieval Italian style. This beautiful armor is constructed of 18 gauge, hand forged steel and crafted by master blacksmiths. This knightly suit of medieval armor is shipped partially assembled with a gorgeous hardwood display pedestal. Italian Gothic Suit of Armor includes a full size skeletal body and decorative skirt. Due to the limited availability of this suit of armor, this item can only be shipped to the verified billing address of the credit card or PayPal verified address. No alternate shipping arrangements may be made. Buy this incredible Italian Gothic Suit of Armor for $2399.99.